BASEL, Switzerland (AFP) -- Joseph Kosuth, considered one of the pioneers of conceptual art in the 1960s, may walk with difficulty, but he has no plans to slow down. “I've never been busier,” the 71-year-old U.S. artist told AFP in an interview this week at Art Basel, the largest contemporary art fair on the planet. Kosuth burst onto the international art scene in his early 20s, pioneering the use of words rather than visual imagery in artworks, and exploring the meaning of language and philosophical ideas within art. By the time he was 28, he had put on dozens of international shows, his work was on display in major museums including the Tate in London, the Centre Pompidou in Paris and the Guggenheim in New York, and, he says, he was the subject of more than 120 doctoral theses. He still looks like a rock star, wearing a black hat and sun glasses, perhaps to protect against the bright neon of three of his works humming on the walls of the art fair's Sean Kelly Gallery booth. Two of them, inspired by Dutch painter Piet Mondrian’s signature grids of vertical and horizontal black lines and blues and reds and yellows, but set on neon-lit silkscreen and filled with text, were made this year. Those two pieces sold for 160,000 and 180,000 euros ($181,000 and $204,000) at the show, the gallery said. Elsewhere at the fair, Kosuth's first-ever exhibition piece “Nothing,” which debuted in 1968, is on display. It consists of 10 large black boards each displaying dictionary definitions of “nothing” in white lettering. Asked how the art world has changed in the half century since he entered the scene, Kosuth complained that “corporate culture” was increasingly taking over. He pointed out that traditional art history, examining the ideas behind the works, had in the past 15 to 20 years faced competition from a new art history: the history of the art market. “So you talk about the prices of Jeff Koons or Damien (Hirst), which is not talking about the ideas engaged in the work. So this is a serious concern,” he said, as elegantly-clad deep-pocketed investors inspected his own work in the background. The problem, he said, with the growing sway the super wealthy hold over the art world is that “a busy billionaire doesn’t have time to study art,” and often determines which pieces are important by the price being paid for them rather than the ideas behind them. “But the thing is that you can’t compare art to a handbag,” he said. 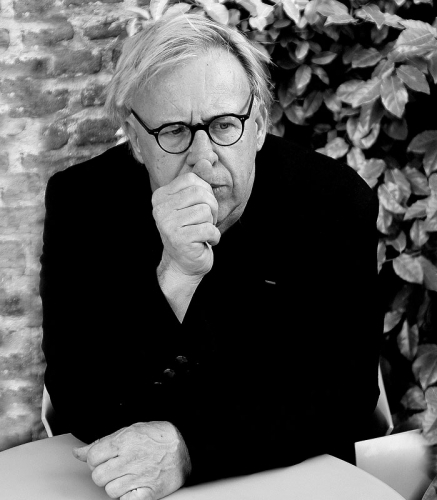 The obsession with money and short-term gains that have seeped into our social fabric have not only wreaked havoc on the art world, Kosuth said, despairing at the state of politics in his country. “My work survived (former U.S. president) George Bush, and I thought it couldn’t get worse than that,” he said. But that was before the presumptive Republican nominee in the upcoming U.S. elections, Donald Trump.